Exploring lava tubes is a great way to get to know more about the volcanic processes that continue to shape the Big Island, especially when there is no lava flowing on the surface. Because they are easy to access and have a fascinating formation history (rivers of lava!) they are a perfect family outing, but more hard-core and multiple-hour spelunking guided tours are also possible. Use the Table of Contents to skip ahead to your favorite lava-tube-related content. Please be respectful and use common sense while visiting the lava tubes. These caves are a limited resource and preserving them will let future generations share in the wonder then can evoke now. Please don’t break off rocks or take loose rocks out of the caves, don’t leave trash, and don’t vandalize the cave walls using spray paint or sharp objects. Mahalo nui loa! Map with the locations of the lava tube systems described in more detail below. The color coding of the symbols denotes price (free in lighter green, tour only in darker green) and accessibility (red/orange = not accessible to the public). The lava tubes we describe in this section are open to the public and easy to visit without (too much) preparation. The Thurston lava tube, HueHue, and the Kaumana Caves are all free to visit (no entrance fee other than the park entrance fee for the Thurston lava tube). The Kula Kai Caverns and the Kazumura caves are only accessible as part of a guided tour. The preferred name for the Thurston lava tube is Nāhuku, which literally means “the protuberances” in the Hawaiian language. Nāhuku is the most easily accessible of the lava tubes on the Big Island and is one of the main attractions of the Hawaii Volcanoes National Park. You can explore part of this large 500-year-old cave, that was left behind after a lava flow, with a stroll from the parking lot through the rainforest. The ceilings are high (up to 20 ft in places! ), the floor is flat, and there is lighting installed all along the 600 ft. stretch of the cave, which is open to the public. To get to and from the cave you will have to make a short hike through the lush rainforest. The tube itself is a great introduction to lava tube geology. You can see the solidified drips and waves of once-liquid lava and the beautiful shapes and colors of minerals draining from the rocks. Entrance fee: The lava tube is located inside the Hawaii Volcanoes National Park so you will need to pay the park entrance fee to visit. Getting there: Nāhuku is located inside the Hawaii Volcanoes National Park next to Volcano Village. Take a left after you enter the park and follow the Crater Rim Drive for 1.7 miles (2.7 km) to get to the Nāhuku parking lot. Entrance to Nahuku. This lava tube was “discovered” in 1913 by Lorrin Thurston, a local newspaper publisher. At that time the roof of the tube was covered with lava stalactites which inspired its official name: Nahuku. Kaumana Caves Park is a skylight in a 25-mile long lava tube that was created by a 1881 flow from Mauna Loa. You can explore the caves a short way in both directions before the lava tube enters private property. There are about 2 miles of lava tube here that are accessible to the public. Important! Bring a flashlight and shoes with grip if you intend to travel beyond the cave entrances. These caves are one step up from the Thurston lava tube and if you want you can spend quite some time exploring the dark tunnels. However, a short 15 minute visit will already give you a good feel of how massive lava tubes can get. To get to the caves you need to climb ~20 ft. down steep stairs, after which you can enter either the left or the right tube. The left starts with a big hall that appears to be a dead end. Look to your right to see a small (~4 to 5 ft) opening that you can work yourself through. The cave opens up afterwards and you can follow it for another ~15 minutes. The cave on the right is, at least at the start, more easily accessible and can be followed longer. Use caution if you decide to explore the caves past the first few 100 feet, as low ceilings, ledges, and outcroppings make it easy to bump your head. 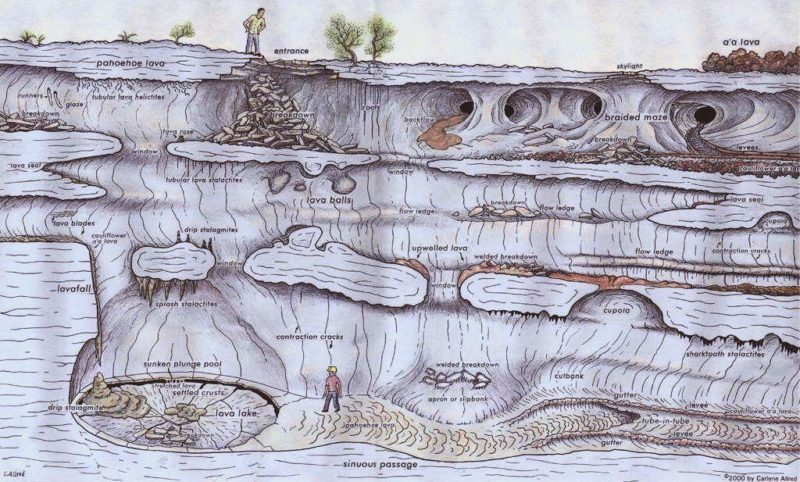 The height of the cave varies from 30 feet to less than 3 feet in some deeper sections. Good to know: Bring appropriate clothing (long pants, sleeves) and bug spray, sturdy shoes, and a flash light. Official website: No official website but a good place for further reading is the Big Island Hikes website. Getting there: Follow Saddle Road (Hwy 200) from Hilo to between the 4 and 5 mile marker. The caves are located across the road from the parking lot. The park grounds also include picnic tables, a tap with drinking water, and restrooms. Kazumura Cave is one of the longest known lava tubes on our planet. It was formed during several eruptions of the Aila’au Lava Flow 500 to 600 years ago, on the flanks of the Kilauea volcano, and has many interesting features. These include canyon-like passages due to thermal erosion, multiple level tubes, lava falls, and ‘frozen’ lava lakes, some of which may not be accessible by a simple tour. In the year 2002 the length of the cave was measured at 40.8 miles (65.6 km), roughly half of which are side branches. The cave drops 3,602 ft (1,098 meters) over its length, also making it one of the ‘deepest’ known lava tubes. Geologically speaking the Kazumura caves are referred to as a “master lava tube” because you can find nearly every type of lava tube feature in this cave. Kazumura caves are an excellent and extremely interesting place to visit for anyone with a healthy interest in volcanic eruptions, exploring, and learning about lava tube formation. Official website: None, but see, for example, this Wikipedia page for a summary. Or read “Description of development and morphology of the Kazumura Caves” in the Journal of Cave and Karst Studies (pdf) for a full description. Entrance fee / Tours: Access to the Kazumura caves is possible as part of a tour. Two companies organizing such tours are Kazumura Cave Tours (Keaau) and Kilauea Caverns of Fire (Kurtistown). Getting there: The cave runs through a large part of the Puna district and there are over 100 entrance points to Kazumura that have been documented. All of these are on private lands but some of these landowners organize tours of the caves. See the websites for the tours listed above for directions. The Kula Kai Caverns are part of the renowned Kipuka Kanohina Cave System on the southern part of the Big Island. Good to know: Access to these caves is only possible as part of a tour. See the website below for details. The Kipuka Kanohina Cave System is currently listed as the second longest lava tube in the world and is highly braided and maze-like, with multiple levels and confusing passages. The cave contains several Hawaiian artifacts and evidence of ancient habitation. It also contains soda straw stalactites, numerous large lava balls, many significant gypsum deposits, and paleontological specimens. Access to these caves is possible for casual visitors with a hour-long tour. Longer, more intensive tours, are also available. Official website: None, but find more info on the Cave Conservancy of Hawai’i website. Entrance fee: There is no public entrance to this lava tube but you can reserve guided tours via the Kula Kai Caverns website. Getting there: The Kula Kai Caverns entrance is located within a gated community just off the highway in Ocean View (92-8864 Lauhala Drive), halfway between Kailua-Kona and Volcanoes National Park at 1 hour drive west from Volcano village. The Huehue lava tube is located about 2 miles north of the Ellison Onizuka Kona International Airport at Keahole and was created during the 1801 Huehue flow from the Hualalai volcano. It is clearly visible from Hwy 11, but at the moment we do not recommend that you stop there for a peak because there is no safe way to park your car. 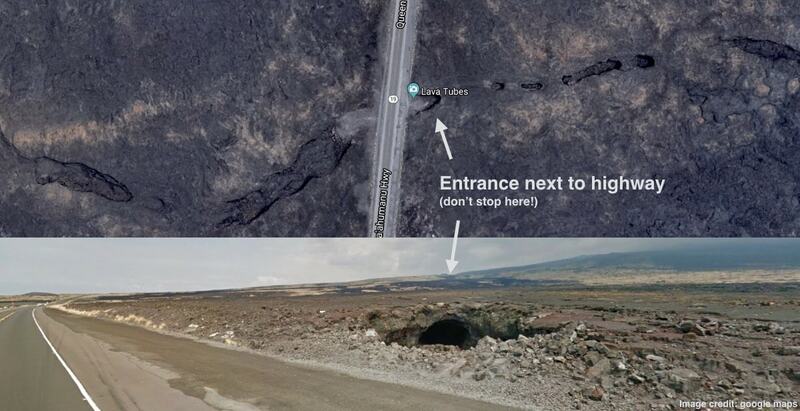 As of January 2019 no-parking signs and concrete barriers have been installed at the lava tube entrance. A no trespassing sign is also posted at the entrance to the lava tube. 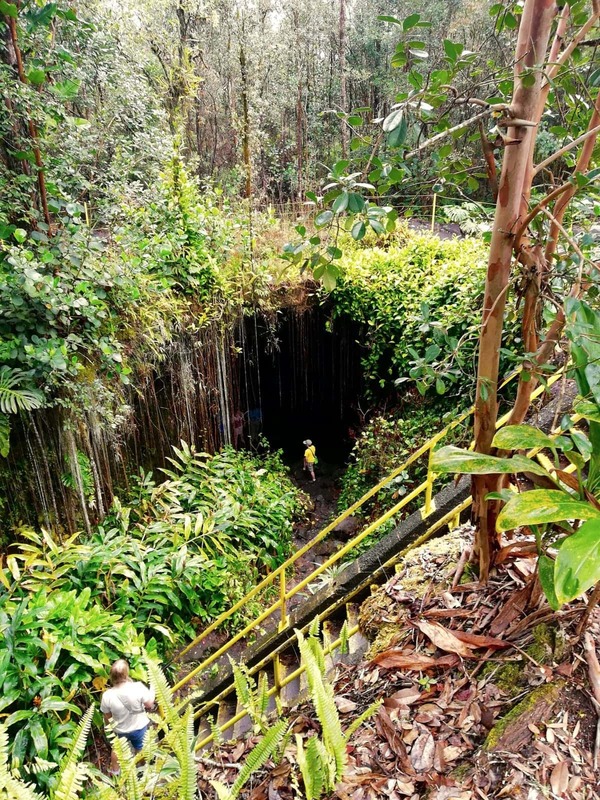 The state is currently looking into ways to manage access to the Huehue lava tube and we will update this space once more information is available. Until then, please avoid stopping here, but allow yourself to enjoy the view as you pass by. Getting there: Follow Highway 11 for two miles towards the north. The lava tubes we have described above are well-known, and are generally safe to enter. There are, however, hundreds to possibly thousands of other lava tubes here on the Big Island, with new ones being created with every new eruption. Hawai’i Volcanoes National Park: Lava Tube Tumulus and Skylights Climb (down the Chain of Craters Road). It is not possible to enter the tube, but you can get good views of the cave from several skylights. Read more on the Instant Hawaii website. 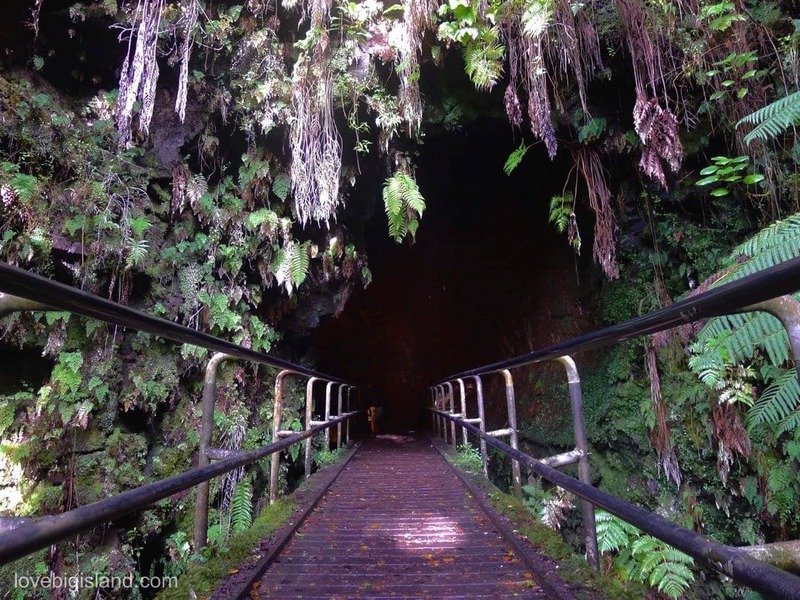 Hawai’i Volcanoes National Park: The Pua Po‘o Lava Tube is almost as large and open as the Thurston Lava Tube (Nāhuku) but far more exciting! Access to this tube is possible as part of a guided tour with the Friends of the Hawaii Volcanoes National Park. These tours sell out quickly and are not regularly organized. See this website for more details, and/or contact the Friends at [email protected] / call them at (808) 985-7373. Waikoloa (Kohala coast): You can find a lava tube shelter cave in the Kalāhuipua’a historical park on the grounds of the Mauna Lani resort. The park also contains petroglyphs and extensive fishponds. The lave tube was used as shelter by ancient Hawaiians and there are interesting skylights in the short cave. Bring a flashlight to avoid hitting your head on the sharp ceiling or stumbling over loose rocks, read more about visiting these caves on the Big Island Hikes website. Lava tubes offer a wonderful world to explore geology, volcanoes, and the unique ecosystems that exist in their dark tunnels. In the following section you can learn how lava tubes form, what kind of geological features you can find in them, and, last but not least, what you should bring along for a safe visit. The second lava tube formation mechanism happens at the front of a Pahoehoe lava flow. These flows often progress in an ongoing series of small breakouts of lava ‘toes’ that quickly build up multiple layers high. While the outside of these toes cools down and hardens, the lava continues to flow through earlier-formed toes, particularly those near the center of the flow field. This continued flow causes the walls separating individual toes to become soft again and eventually the toes start to coalesce to form a lava tube. You can see this illustrated e.g. on this website. There is ample documentation of lava tubes on the moon. These lunar lava tubes are often revealed by satellite images through their sky lights (a collapsed part of the roof of the tube) and are possible locations to build human habitats. Similar to the lunar tubes, lava tubes on Mars are suggested as possible places to set up habitats in the future because they offer protection from the environment. This is highlighted in the very entertaining and educational National Geographic series ‘Mars‘ (IMDB). The longest lava tubes we have found in our solar system are on Venus, and are more than 4,200 miles (6,800 km) long! Lava tubes offer a wonderful view of geology through many different lava formations, including: lavacicles (stalactites made of lava), lava roses, shark tooth stalactites, lava balls, crusted over lava lakes, lava falls, and many more! Map showing different features you can find in lava tubes. Image credit: Carlene Allred / the Virtual Lava Cave website. Sturdy hiking boots that will support you on wet and uneven surfaces that could crumble. At least two flashlights with full batteries (one for backup). Enough water to keep you hydrated. Long pants to protect your legs from scraping.